All transactions are safe and secure with a reliable history in online purchasing behind each of our associates. 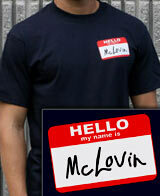 Buy the Superbad McLovin Name Tag t-shirt to own Superbad clothing and merchandise. The front of this Superbad tee displays a natural looking red and white McLovin nametag. The name on the tag appears as if it was written with a black Sharpie. Available in six different sizes, the design on this tee gives you the chance to represent the future cult comedy classic. Whether you can relate best to Seth, Evan, or Fogell, this design along with the Superbad movie poster art tee below is the perfect movie merchandise combo. Wear it with related Superbad hats. In addition to the Superbad McLovin Name Tag tee above, browse the Superbad Clothing Gallery for more apparel like men's and women's clothes, kids shirts or hoodies.